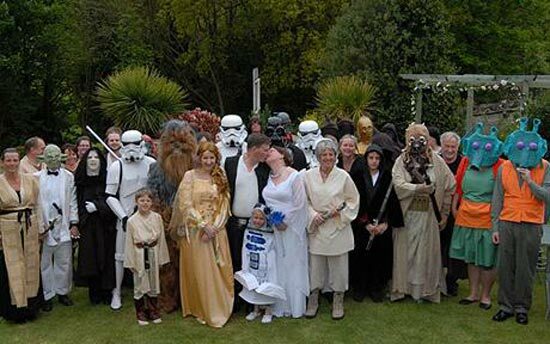 Two Star Wars fans got married yesterday surrounded by friends and family dressed as characters from the movies. 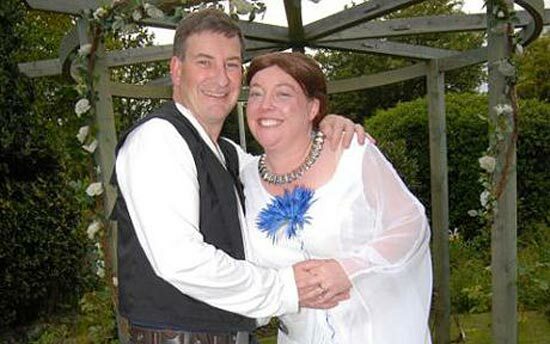 In a pun on the films’ famous phrase “May the force be with you,” Duncan Thomson, 41, and Sammi Gardiner, 39, chose Monday as the date for the service so they could bill it as “May the 4th be with you” according to London’s Daily Telegraph. The couple, from the Isle of Wight, invited the movie’s director, George Lucas, who sent back an RSVP letter bearing his Skywalker Ranch stamp saying he could not make it. The couple also sent invitations to actors Harrison Ford, Carrie Fisher and Mark Hamill-who played Han Solo, Princess Leia and Luke Skywalker in the films-but they did not attend. However, despite his absence, the bride and groom tied the knot as Han Solo and Princess Leia, exchanging vows themed on their favorite scenes. The couple were joined by Thomson’s son Kieren, 18, who, as best man, played the part of Solo’s sidekick Chewbacca the Wookiee. His daughter Charlotte, 20, carried out her duties as head bridesmaid while acting out the part of Queen Padme Amidala.